July and August 2011 Empties - Super Long! I skipped last month's empties post because I only had two completely empty containers but a bunch which were almost finished. As you can tell, I recently finished a lot of skincare products and it's a bit odd how well they color coordinate together! I have reviewed most of these products at one point or another already so I will just touch briefly on each one and you can click on the product name for the full review if I have done one. The Body Shop Seaweed Toner (sample) - This is an okay toner but nothing special. It does feel somewhat refreshing but it also contains a bit of alcohol in it (not a lot, but it's there). I will not be purchasing the full size after finishing two of the minis. The Body Shop Seaweed Mattifying Day Cream (sample) - Moisturizers tend to last me forever and this one is no different. I only need to use a smidgen for my whole face and while it does soothe the skin, I didn't feel it had any oil controlling properties. I have another mini of this to use up but will not repurchase the full size. The Body Shop Night Treatment (sample) - I use this as my night moisturizer although it is more like a serum. This did nothing bad nor good to my skin and therefore, it will not be a repurchase. Lancome Bi Facil Eye Makeup Remover (sample) - I featured this in my July Favorites post and I really like this eye makeup remover. The steep price is the only drawback and the only reason I am not purchasing the full size right away. The Up & Up remover is pretty much the same thing so I am sticking to that for now since it is more economical. DDF Mattifying Oil Control Moisturizer SPF 15 (sample) - This was another sample that lasted me forever. It is a decent moisturizer for makeup-less days when you're going out for a quick second since it has a bit of SPF. I feel like this mattifies better than The Body Shop's Seaweed Day Cream. The $42 price for the full sized 1.7 oz tube is not very attractive and I have a bunch of other moisturizers with SPF in my stash already so no need to repurchase. 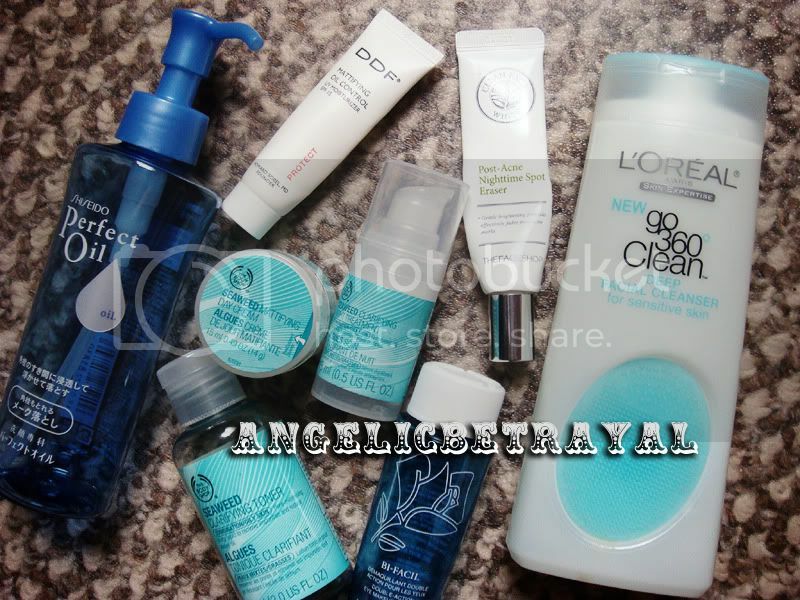 Loreal 360 Cleanser for Sensitive Skin - I used half of the bottle as a face wash but I didn't like it much at all. My skin didn't feel especially clean and the scrublet did nothing for my face. I used the rest up as brush cleanser. This worked pretty well on my brushes and got all of the tough to remove residue out so it wasn't a complete fail. I would not recommend this as a facial cleanser though. Shiseido Perfect Oil Cleansing Oil - I really like this cleansing oil and it will always hold a special place in my heart since it was the first cleansing oil I ever tried. I would repurchase this if I didn't have so many others I want to try. I am currently using the Kose White Cleansing Oil but I much prefer the Shiseido one. The Face Shop Spot Treatment - I didn't really notice any dramatic changes to my acne scars while using this so I was pretty disappointed with this. The formula feels like a light moisturizer and it absorbs pretty well into the skin. Everything else was pleasant about this product like the light citrus scent and decent price ($15) but ultimately it did not do what it was supposed to do. Thus, I will not be repurchasing this. I always cut open my tubed containers when I can't squeeze anymore product out because there's always more product hiding inside. 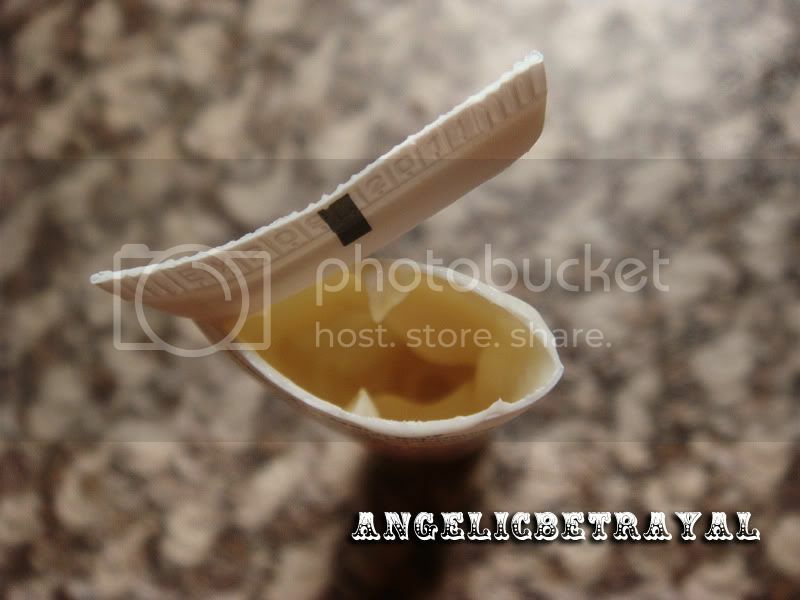 You'd be surprised how much product and money you were throwing away if you never cut open the tubes! The Face Shop Single Eyeshadow in Freshian Pink - This was the first eyeshadow I ever bought in my whole life and I obviously did not do my research when I first started out. This is about three and a half years old and it just doesn't get enough love because the pigmentation is just not quite there. I bought another one from this line in a baby blue color which I also tossed recently. I will be giving this pink shade to my friend to see if she has use for it. If not, in the trash it will go. I hate throwing out makeup and rarely ever do but sometimes it has to be done. Lancome Definicils Mascara (sample) - I didn't use up all the product but it dried up past its prime and doesn't do much for my lashes anymore. I have tried multiple samples of this and I still have a few in my stash waiting to be opened. This is a solid mascara which I like but I will never buy the full sized version as it costs $25. I do not think I will ever pay full price for one high end mascara because I throw away my mascaras after about six months of use. I like the Maybelline Colossal mascara better than the Definicils anyway and I have a few more unopened mascaras to use up. Maybelline Age Rewind Face Primer- I bought this awhile ago and never reached for it. At the beginning of the month I made myself use it to see if I liked it and to get my money's worth. Unfortunately, it broke me out quite badly and I believe the culprit is dimethicone, the primary ingredient in this primer. I don't think I need a face primer anyway because my foundation lasts without one. I try not to put unnecessary products on my skin since I do have oily skin and the more layers I put, the more prone to breakouts I am. Judging by other people's reviews on this primer, it's mostly a personal reason why this doesn't work for me. I will be passing this onto my friend to see if she likes it. Check out the video if you want to see how the products look a bit better! Wew~ I finished a bunch of skincare products lately so I have quite a few new products that I'm in the process of using and formulating my opinions on. I'm also taking care in weeding out some makeup that I do not use or like so I can streamline my collection. I believe I don't have many more makeup products to do away with for now though. I'd love to see what you finished this month so let me know in the comments! I love seeing your empties! 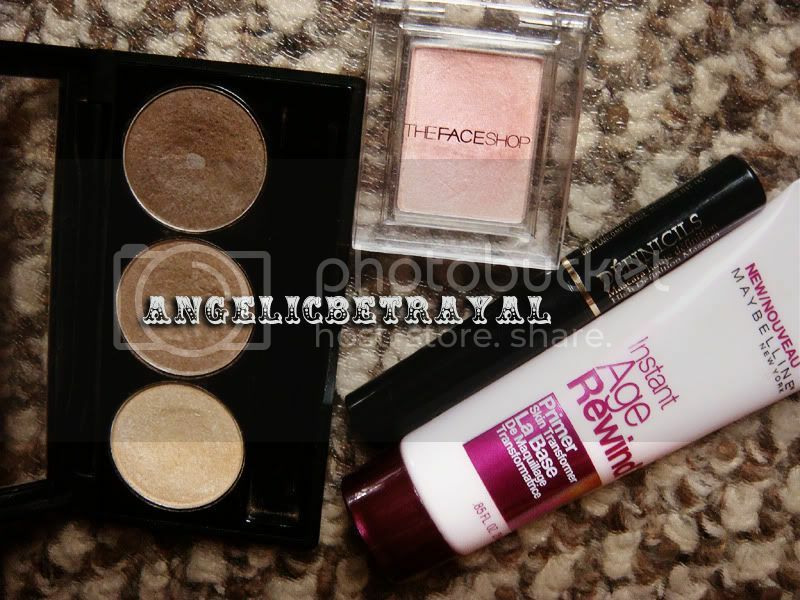 Nothing is more gratifying than using up products in your collection! Thanks for your tip about cutting open tube products, I didn't realize how much more of my moisturizer I had left until I cut it open! I was going to throw it away too! So many empties! I haven't finished many products recently :\ Ahh I want to finish something up soon! What do you do with the product after you cut open the tube? Do you just leave it like that and take out whenever you use it or transfer it to a jar? What do you recommend for a cleanser? I've been using a lot of these products for many months Mandy so it's about time I finished them XD I usually will not transfer the contents of the tube into another jar because there usually isn't much product left. But I keep small sample empty containers just in case I need to put some product aside for traveling or something. I meant where do you recommend putting the cleanser into after you cut the tube (if you did at all) but you already answered haha But thanks for the cleanser suggestions!